Phillip Scrubb a member of the Carleton University Ravens scored a game-high 35 points as Canada defeated Argentina 83-79 in overtime of the opening game of the 2011 Pan American Games. Scrubb was deadly from behind the arc, including 8-of-15 three-pointers, he also went 11-of-14 from the charity stripe in a game-high 38 minutes. Ravens teammate, Tyson Hinz also finished in double-digits with 13 points and five rebounds. Warren Ward (Ottawa Gee-Gees) was the games leading rebounder with 10, but shot only 2-of-14 and finished with only 6 points. Canada improves it’s record to 1-0 and will face Mexico in their upcoming game. Coming into the tournament many Canadian basketball fans were surprised when Canada Basketball, the country’s governing body released a roster based solely on Canadian University players. The rosters is pretty much the same as the team that went down to China and earned Canada a Silver medal at the 2011 Universiade Games. It’s not surprising to see Phil Scrubb take over a game of this magnitude. The Richmond, British Columbia guard has had a fantastic start to his second-year and has already hung big numbers some NCAA division one teams. Jay Triano has officially stepped down as the head coach of Canada’s senior men’s national team. Canada Basketball made the announcement this morning, confirming media reports that circulated on Sunday. “I can’t thank Jay enough for all he has done for basketball in Canada,” said Glen Grunwald, president and CEO of Canada Basketball, in a statement. “As both a coach and player, Jay is a Canadian icon and has played a major role in the development of basketball within our country and we will forever be grateful for his contributions. Triano is the first Canadian-born and Canadian-trained coach to work in the NBA, starting as an assistant with the Toronto Raptors in 2002 and later promoted to head coach. He is currently the lead assistant coach with the NBA’s Charlotte Hornets. As head coach of Canada’s national team from 1998 to 2004, Triano led the team to a seventh-place finish at the 2000 Olympic Summer Games in Sydney, Australia. Canada has not returned to the Olympics since then, but it figures to be a contender to play at the 2020 Games in Tokyo. Triano returned as head coach in 2012, guiding the club to a pair of victories during the FIBA Basketball World Cup 2019 Americas Qualifiers. As a player, Triano served with Canada’s national team from 1977 to 1988 and was team captain for the final seven years of his tenure. He was elected to the Canadian Basketball Hall of Fame in 1993. 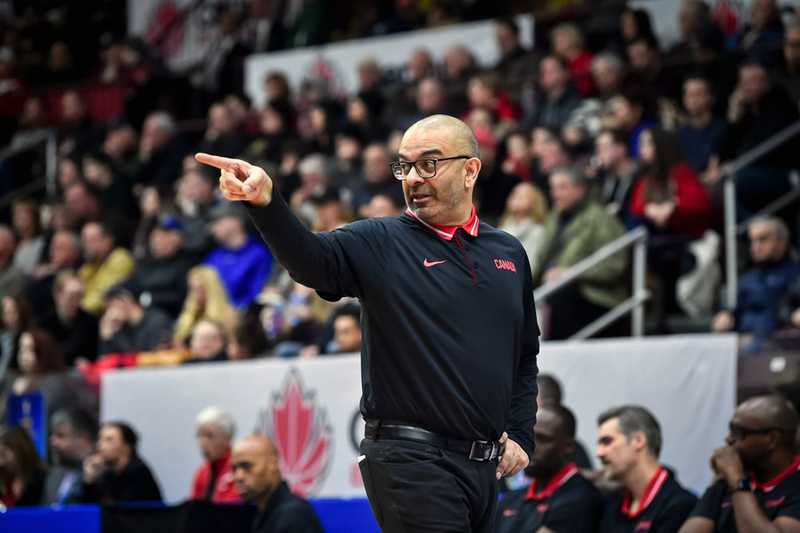 Ryerson University head coach Roy Rana is among three other candidates being granted interviews to replace Triano, according to Sportsnet’s Michael Grange. The other candidates are Gord Herbert, who played for Canada at the 1984 Olympics; and Ettore Messina, an assistant with the San Antonio Spurs. A final decision is expected by March 31. Multiple reports say Triano cited “personal reasons” for taking his name out of the running, but he did not elaborate. Team Canada’s next major test will be the 2019 FIBA World Cup, starting Aug. 31 in China. Triano steps aside at a high point in Canadian basketball, with dozens of players in the NBA and at elite NCAA schools, including Barrett’s son R.J. Barrett, a Duke University standout who is projected to be a lottery pick in the 2019 NBA Draft. Canada’s path to a 2019 FIBA basketball World Cup medal and hopes of a 2020 Olympic berth took a serious blow prior to the start of the games as No. 23 Team Canada was drawn into the group of death — alongside global powerhouses No. 6 Lithuania, No. 11 Australia, and No. 37 Senegal. For Canada to have a shot at getting to the podium they will have to finish in the top two spots of Group H to advance to second round of the tournament — where the top 16 teams will be split into four new groups (Groups I, J, K, L). If it reaches that stage Team Canada will once again have to finish in the top two to advance to the quarter-finals. Canada’s road to the 2020 Tokyo summer Olympics is a complex and tough process — given FIBA’s decision to make the World Cup apart of the qualification process. Seven spots are currently up for grabs at FIBA’s flagship event and with hosts Japan earning an automatic entry the room for error is minuscule. To reach the Olympics, Canada will have to finish as one of the top two teams from the seven team America’s region that features the world’s number one squad in the United States of America alongside traditional mainstays Argentina, Brazil, Dominican Republic, Venezula and Puerto Rico. If Canada is unable to secure a spot as one of the two top America’s region teams, they will hope to be amongst the top 16 teams at the 2019 FIBA Basketball World Cup where they will be granted automatic qualification to a last chance tournament taking place next summer at a yet to be determined locations. If unable to finish in the top 16, Canada’s last hope would be one of the last eight countries that FIBA would invite for one of the last-chance qualifier tournaments. Therefore, if Canada has any hopes of qualifying for the 12-team 2020 Summer Olympics via the World Cup they will need to advance from Group H one as top two teams, failure to advance in the premilinary round will automatically put Canada’s hopes at the mercy FIBA via the invitation tournament only. Should Canada reach the second-round they will be placed in the newly formed Group L, alongside Group G winner and runner-up — potentially setting up another group of death with No. 3 France, No. 11 Germany, No. 11 Australia or No. 6 Lithuania. To make matters worse for the Canadians, they have been pooled on the same half of the draw as the United States — which would mean a potential quarter-finals match-up between the two neighbouring nations, if Canada can somehow get there. If the Canadians can reach the quarter-finals there is a good chance they alongside the USA would be last two standing Americas teams — thus earning automatic berth to Tokyo 2020. As evident, by the World Cup draw and given FIBA’s recent changes it’s clearly going to be a tough road for the Canadians to fullfill their 2020 vision of becoming a global basketball powerhouse.